The Remaindererarrived today. 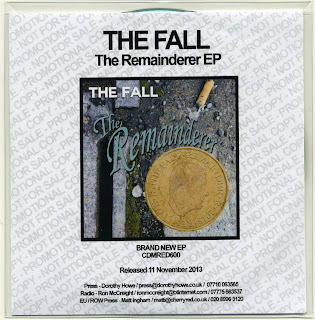 A new six track EP from The Fall. Originally slated for release on the 11th of November and weighted with a sense of expectation after receiving radio airplay. It would be unkind to make comparisons with Slates – after all it has been 32 years and fans of the group tend to hold that particular disc in very high regard. Neither an LP nor a single it was excluded: the release missed all kinds of charts but touched all kinds of hearts. This listener was not even 16 and in the years before everyone had electronic gadgets John Peel was an evening’s entertainment. 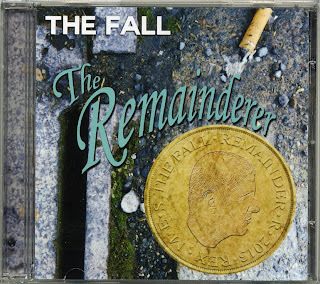 The Fall’s previous 10” release was the marvellous Masquerade back in 1998 and this vinyl was also accompanied by two cd singles which more or less made up a mini LP. The Remainderer can also be enjoyed in different formats. The title track lopes, with an amazing double drummer sound reminiscent of Hex Enduction Hour-era tunes, and throbs over squirting squelching and droning electronics. The vocals are very much instruments here. The voice growling and gargling, hissing sibilants and rasping the Rs, on the cd the backing vocals are multi-tracked versions of the main vocal refrains and we learn “it was a good day… whatever that is”, while on the promo cd and the 10” vinyl, there are various backing singers “manipulating to leaving” or “manipulate into leaving”. Or indeed both! Both versions of the song are stunning, simple ideas welded together by a group having fun and sounding relaxed, assured and about to fall apart in an exciting way. Exciting is the word that sums this EP up. It’s invigorating. Second track Amorator!is so speed driven it’s jaggy juju guitars and drums almost trip over themselves before blissing out with vocals oscillating from whispers to growls. 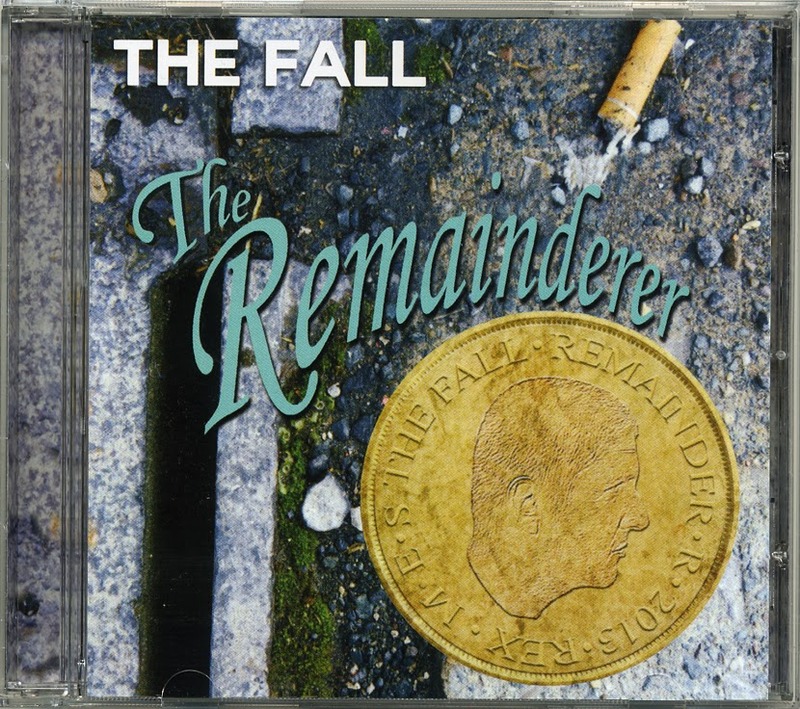 There’s something swaggering and punky about The Fall on this release, like the New York Dolls on Jet Boy blended with dirty heavy metal and a healthy dose of rockabilly. Mr Rode rumbles in like a slower-paced strangely filtered Motorhead before chiming, swaying guitars and vocals kick off and repeat in layers to lift the song in a melodic euphoria that builds and builds wrapping ghostly vocal mutterings before taking off to a powerful climax. A Fall classic. Another instant classic cements the centre of this six track EP. Remembrance R opens with warbling and gargling then plays melodic vocal against a massive bass line, recalling Joy Division but also Perverted by Languageand spinning a whole new musical web of its own across uncharted territory. Although we are treated to a race through two Gene Vincent covers, Mark E Smith is channelling an amphetamine-fuelled Elvis and sampling his own group’s live archive. Race With the Devil appeared on the Backdropbootleg – performed at John Peel’s 50th birthday party many moons ago. The final track Touchy Pad is a modern psychedelic classic, perfect pop in under two and a half minutes with ever-so-slightly off key singing, declaiming and backwards guitar offsetting the clear leading melodies. As always with the lyrics, worlds are suggested, new literatures are revealed, and repeated listenings alter and add to these glimpses. Sounds and ideas combine with the music in intelligent, innovative and interesting ways. These aren’t just songs these are little works of art. The Fall sit well with The Velvet Underground and with Captain Beefheart as important cultural examples of music and art and as a group are a vital creative force. 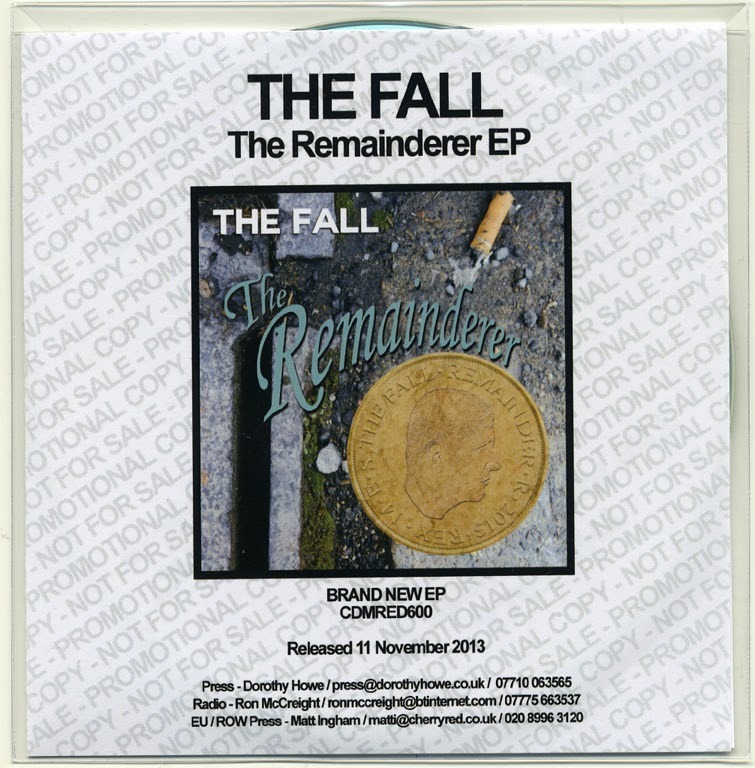 Re-mit took The Fall into the top 40, back into the charts. The Remainderer should be X-mas number one. Where some of Re-mit’s tracks could be seen as anti-music, this astonishingly lively EP is an antidote to the anodyne, sterile world of auto-tuned blandness and unhappy twerking that passes in some places for culture.